Lawn mowing tractors come in different horsepower and sizes of cut. Here are a few simple criteria for determining what size tractor you need. Make sure you get the right tractor for your lawn size. 1/2 - 1 acre — For a lawn this size, you'll want a riding lawn mower with a cutting width of up to 42" and at least a 14 HP engine. 1 - 2 acres — For yards in this size range, a riding lawn mower with a 42" or 46" deck and an engine in the 14 - 16 HP is necessary. 3 Acres or more — If your estate is in this extra large lawn grouping, you are indeed fortunate. 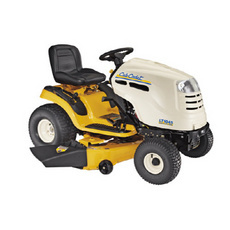 For this size lawn you'll want a garden tractor with a 46" - 54" deck and an engine of 18 - 24 HP. Besides lawn size, how else do you determine how much lawn tractor you really need? Riding lawn mowers are a lot like cars-- there are basic, no-frills models and feature-laden, power-packed high end models-- and everything in between. The next thing you need to consider are attachments such as a leaf catcher, dozer blade, garden plow or snow thrower. If you will need one or more of these now or in the future, you need to buy a lawn tractor that can accommodate them. What's the difference between a riding lawn mower and garden tractors? If you will be using the tractor just for cutting grass, a riding lawn mower is fine. They have several attachment options, but don't expect it to do any heavy lifting or pulling. If you will be using the mower to pull ground engaging attachments, such as a plow, disc harrow or tiller, you will need a garden tractor. A garden tractor has a heavier frame and transmission, larger rear wheels, and is also appropriate for larger mowing jobs. A garden tractor has the highest horsepower (generally 20 - 27 hp). Residential garden tractors can pull a tiller, cultivator, thatcher or other ground-engaging tool behind it, but to do so they need more power than typical lawn tractors. If you have few obstacles to mow around, a gear driven tractor is an excellent choice. It will provide a constant, steady speed to cut the grass. If there are a lot of obstacles, you should choose an automatic transmission tractor (pedal drive tractors) that will allow you to speed up or slow down without clutching. An automatic tractor has an infinite number of speeds. Many riders do a great job of bagging and mulching, but some larger decks are not designed to do either. Two engine types are available: Twin cylinder engine-- (usually 16 HP or larger) These have better balance, more power, cooler running and longer engine life. Single cylinder engines-- These offer plenty of power for mowing smaller lawns. Getting the best deal when buying a new riding lawn mower? Shop around. The prices of same-model lawn tractors can vary a lot from one store to another. Compare prices at three or four stores and you can save a $100 or more. Look for close-outs on "last year's models". Like cars, lawn mower styles and models change from year to year and stores must move old inventory to clear room for the new models that will be arriving soon. This means deep discounts. Sticker price doesn't necessarily translate into the price you pay. Take a note pad with you of competitive store prices and ask them to beat those prices. They just might, and if the salesman won't negotiate, politely ask the sales person if you could speak to the manager. Managers are usually in a better position to negotiate pricing options.